I have not been to Japan but my girlfriend has so she is familiar with the Maneki Neko cats, which can be seen in the form of little ceramic statues in shop windows and in businesses. They are also placed outside shops. They are meant to bring good luck and tradition dictates that the statues are of Japanese bobtail cats. They are called the lucky cats of Japan. It seems that the usefulness of this cat is not restricted to ceramic cats in shops. Nike make a sport shoe called, Nike SB Pro – Lucky Cat Lows “Maneki Neko”. It is a very nice shoe by the way! Apparently, the original Maneki Neko cats were calico cats (mi-ke). 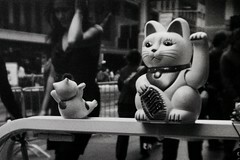 So, how did this culture of the lucky cat start? As expected there are several legends. Perhaps the best known is the one of the feudal lord who on riding his horse stopped at a temple to eat under a tree. A temple cat, a calico Japanese Bobtail, beckoned him inside the temple. He agreed to go in. Shortly afterwards the tree was struck by lighting. The cat had saved his life. The Japanese Bobtail cat has a very long history indeed and so would have been around in Japan a thousand years ago or more. In fact, it is said to originate from the 5th century AD. Another legend concerns another temple, the Gotokuji temple in Tokyo. The year was 1615. One of the temple cats was called, Tama. A leader of Samurai warriors, Naotaka (1590-1659), was passing the temple after a victory at the battle of the seige of Osaka Castle. He was beckoned in to the temple by Tama. Naotaka followed the cat in and soon after the place where he had stood was struck by lighting. He life had been saved. As Gotokuji temple was in a bad state of repair, as a gift of gratitude Naotaka decided to support the temple. Tama was buried at the Gotokuji cat cemetery. The Chinese students that I know, all care about animal welfare. I cannot say the same about the government over there. They are barbarians. I have not spoken to her since she left her grandchildren to tend shop. I will certainly, thank you!